Track your activities the smart way. The Garmin vivosport is a smart activity tracker with wrist-based heart rate and GPS, which lets you accurately track your activities outside while also including a variety of indoor activities. There’s a lot of get-up-and-move packed into this activity tracker. 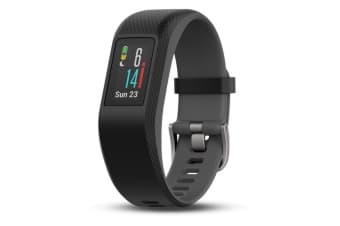 It brings you fitness monitoring tools and all-day stress tracking plus handy connected features, including automatic uploads to the Garmin Connect online fitness community. It’s the complete activity tracking package. Built-in GPS gives you the freedom to take your activities outside. During a run, walk or ride, vivosport is able to track distance, time and speed or pace and even map it out for you on Garmin Connect. It’s also preloaded with additional timed activities, including strength training and cardio, so you can work out the way you like. Monitor key aspects of your fitness and wellness with help from Elevate 24/7 wrist-based heart rate monitoring. With the heart rate data it collects, vivosport is able to estimate your VO2 max and fitness age, 2 indicators of physical fitness that can improve over time with regular exercise. 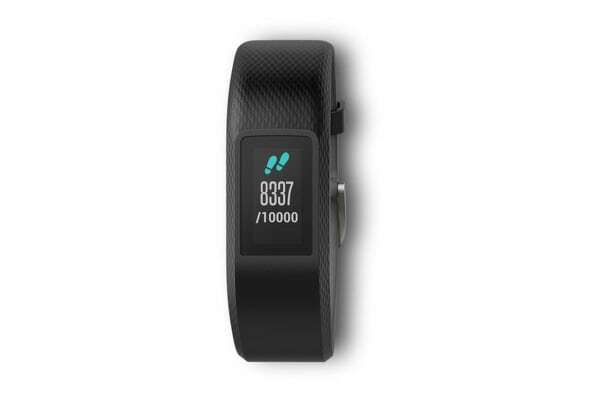 It also tracks your HRV (heart rate variability), which is used to calculate and display your stress level. The goal is to make you aware when physical or emotional sources cause your stress level to rise so you can find a way to relieve the pressure. With all the features and sports it packs inside, you’re going to be surprised by just how thin this activity tracker is. Not only does it complement every outfit and every occasion, it’s perfect for all-day wear, especially since it’s safe for swimming and showering. The always-on Garmin Chroma Display colour touchscreen is responsive and bright enough to see – even in direct sunlight.